At McKendree, we don’t believe that life begins after college - we believe it begins on day one of your McKendree experience. 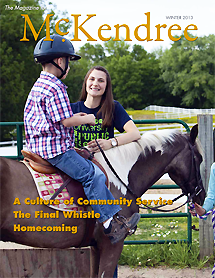 For Denise Kennedy ’12, McKendree meant discovering her passion to live a life dedicated to service, starting with her work as a Community Service Fellow with McKendree’s Lyn Huxford Center for Community Service (CPS) and culminating in her current role as an AmeriCorps VISTA (Volunteer in Service to America) volunteer. In addition, she is working with Lisa Brennan [English professor, assistant director of the Writing Center and coordinator of First Generation Student Success] to develop a Registered Student Organization for our first-generation students. “I am still working on being a good example of a responsible citizen, [and part of] being a responsible citizen means I encourage others to become responsible citizens,” she said.